Updated for 2019: In this guide I’m going to go over everything you need in order to pick the best cheap Android TV box. So, if you’re strapped for cash, but you still want to get a great streaming device, keep reading! 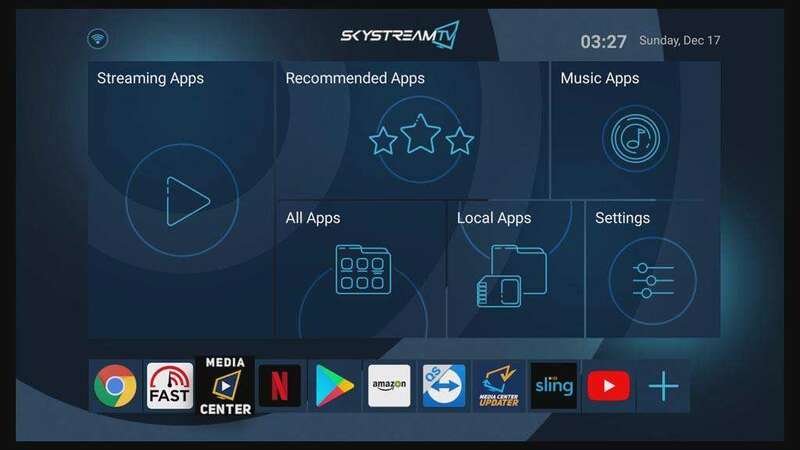 The powerful, super easy to use Android box SkyStream Three is our top choice. I love looking at big houses and fancy cars. It’s great to dream, but at the end of the day, I’m going to get in my Mazda and go home to my little house. It’s the same thing when you’re shopping for a streaming device. You may want to get that $300 NVIDIA Shield that’s on my list of Best Android TV Boxes, but it might not be in your budget. But how do you buy a cheap Android TV box and still be happy? This guide will take you through what you’re going to be giving up when you look at a cheap Android TV box, as well as a couple of things I absolutely will not skimp on – no matter how cheap the device is. Finally, I’ll give my recommendations for Android TV boxes that are low on cost, but high on features. Most of them are around the $50 range, but all are under $100. If you’re ready, let’s dive in! If you’re looking at a cheap Android TV box, you need to understand what you’re giving up. It makes sense that higher priced streaming devices will usually (but not always) have better features. What I’ve found is that most of the cheaper TV boxes will often skimp on some of the things that don’t show up in the specs. Performance Components: You wouldn’t expect a Honda to have the same engine as a Ferrari. In order to bring the costs down, manufacturers often have to skimp on some of the components. 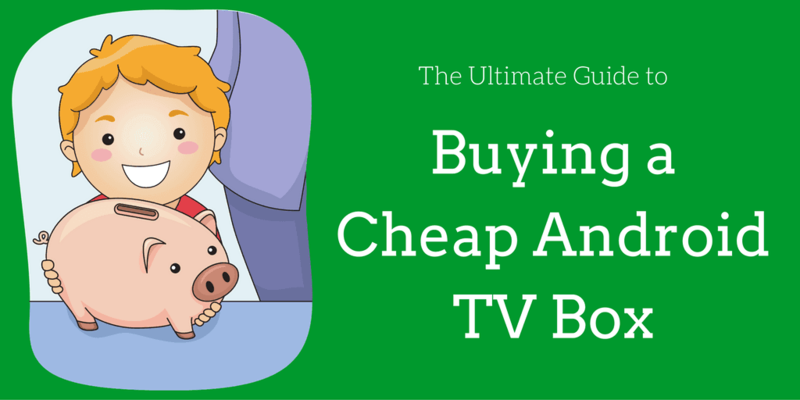 Don’t expect to get a high performance TV box at bargain basement prices. Regular firmware updates: Streaming devices get better over time – if the manufacturer updates them at all. Without regular firmware updates, the TV box that looked like a great deal when you bought it can quickly become outdated. OTA upgrades: If the manufacturer doesn’t offer OTA (Over The Air) firmware upgrades, you may have to use the “toothpick method” and manually update the device. Manual updates are much more complicated and most people just skip them entirely. Forum support: If I’m having a problem with my device, the first place I’ll usually go for answers is to the manufacturer’s forum. It’s rare for the cheaper streaming devices to have a good community support network. Support after the sale: It takes money to run a customer service department. If they aren’t making it on the price of the TV box, this is usually the first thing to go. Now that you’ve got a better idea of what to expect with a cheap Android TV box, let’s go shopping! I will buy most of my devices through Amazon.com, but that’s because I’m an Amazon Prime member and I get free 2-day shipping. What can I say? I’m impatient when I shop for my tech. Note: You can see a full write-up of my shopping experience in my GearBest Review. That being said, a quick look at Geekbuying and Gearbest list over 500 TV boxes! Ouch. Now, that counts the same box with slightly different specs listed multiple times, but still…that’s a lot of possibilities. Let’s try to narrow down that list a little? There are some things that I simply won’t skimp on – no matter how cheap the TV box is. It MUST have Android 6 or Android 7: Unless you’re stuck in 2016, there’s absolutely no reason that you should be buying a TV box that still runs Android 5. No Generic TV boxes: Seriously. If the company can’t put it’s own name on their product, how much do you think they’ll support it after you hand them your money? If it says “Allwinner” or “RockChip” just skip it: It’s been very, very well documented that Allwinner has been copying its development code from other companies without getting the proper licensing, which is a no-no in the open-source community. Similarly, RockChip has absolutely no developer support from within Team Kodi. Personally, I wouldn’t want to buy a device that isn’t 100% compatible with the most popular app I’m going to run on it. It MUST have a custom launcher: If your wife, girlfriend, boyfriend, etc. is going to be using the TV box, you’re going to hear a lot of complaining if it’s not easy to use. I don’t want to hear them complain, do you? Those five things help narrow the possibilities down quite a bit, but there’s still a lot of TV boxes out there. I’ve looked over the devices that are still standing and come up with some of my favorites. These are in alphabetic order, so don’t look at this as a ranked list. All of these are good choices from solid companies. Skystream is back again with the SkyStreamThree and this time they’ve doubled down on their success. 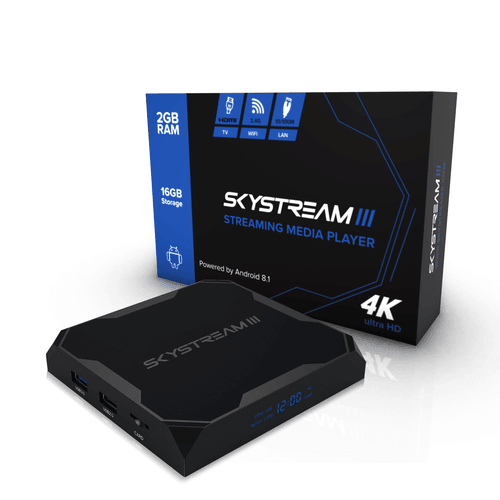 In all seriousness though, Skystream took what made the Skystream Three a killer Android TV box and doubled it. The processor has been upgraded to the Amlogic S912 octa-core CPU – double the cores from the One. The internal storage has been doubled from 16 GB up to 32 GB. System memory hasn’t quite been doubled, but it has definitely been given a big boost. There’s now 3 GB of memory, up from 2 GB. And now DDR4 memory, which has the edge in performance over the older DDR3 in most TV boxes. There’s also a slick new custom interface which is more modern than the brightly colored interface from their older boxes. You’ll still find most of the large icons where you’d expect them to be, but they don’t jump out at you as much as they used to. What really gets me excited is the extra features that they’ve crammed into the Skystream Three. They’ve integrated Google Voice Search into the media center so you can search for whatever you want to watch instead of typing it out on the on-screen keyboard. With Google Assistant, “OK Google” is always available to answer questions. Also new on the Skystream Three is Widevine certification. It’s one of the main requirements for getting Netflix, YouTube, Amazon and Hulu in HD quality. What to love: Looking at the specs, there’s a lot to love. More memory. More CPU power. More storage. Pair that with the famous Skystream support network, and we’ve got a great TV box. What’s missing: Still missing USB 3.0 which will really hurt transfer speeds from external hard drives. There’s also an increase in price to go along with the increases in memory, storage and CPU. The first Android TV box on this list is from Amazon? Actually, yes. 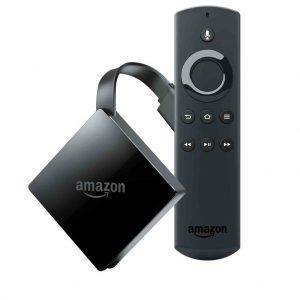 The Amazon Fire TV Stick is already one of the most popular Kodi devices. Amazon upped the ante with the new Fire TV 4K. If you’ve been trying to decide between the old Amazon Fire TV vs Fire Stick, the new Fire TV gives you another option to consider. Let’s start with the basics. The new Amazon Fire TV is not a high-end device. It’s not trying to go after the NVIDIA Shield TV or the Roku Ultra. It’s aiming at the middle ground. Here’s what I mean by that: Gone are all of the ports that were on the original Amazon Fire TV. You won”t find an SD card slot, or an Ethernet port, or a digital optical port. But it doesn’t need them either. Bottom line is that the new Amazon Fire TV is an incredibly tweakable TV box that belongs among the elites. It’s an added bonus that it’s well under the $100 price point. 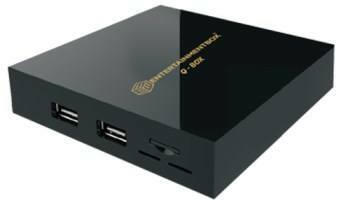 The original Beelink GT1 is one of the first TV boxes to hit the market with the new Amlogic S912 chipset, and the GT1 Ultimate takes it to the next level. The Beelink GT1 Ultimate is running Android 7.1, upped the RAM from 2 GB to 3 GB, and doubled the storage from 16 GB to 32 GB. The octa-core S912 processor has support for 4K video playback at 60 frames per second, 10-bit hardware decoding, 802.11 ac wireless and gigabit Ethernet. Although Beelink has, in my opinion, fairly generic devices, they do have an active support forum and an OTA firmware update process. With Beelink, you’re not going to get a streaming device with a lot of bells and whistles, but you are going to get something that will do the job and not cost a lot. 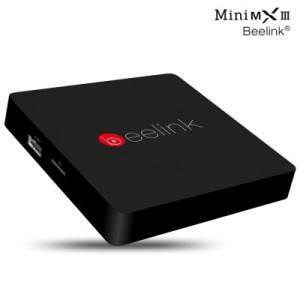 I’ve written about the Beelink MINI MXIII in an earlier article here. The MINI MXIII has the smallest form-factor of any streaming device on this list – just under 10 cm squared. It has the same chipset as the MINIX NEO U1, which is on my Best Android TV Box list, but at less than half the price. With that small size, you are giving up some functionality. There are only two USB 2.0 ports, gigabit Ethernet, a micro-SD card slot and a digital optical out. Wi-Fi is single band 2.4GHz, so expect to use the wired Ethernet, or have your router close by. Even with those limitations, the MINI MXIII deserves a look. It’s got a slick user interface, as well as the OTA firmware update process and good support network as it’s newer brother, the GT1 above. If you live in the UK, you know that this list wouldn’t be complete without one of Entertainment Box’s devices. There are two versions of the MXQ 4K: There’s one with 1 GB of RAM and 8 GB or storage, and the upgraded version with 2 GB of RAM and 16 GB or storage. In this case, definitely spring for the upgraded RAM and storage. You won’t regret it. What I love about Entertainment Box is their support network. They have an extremely active user forum, and have fairly regular firmware updates available for their devices. There’s no OTA firmware update process for the MXQ Pro at the moment, but they say it’s on the way soon. Finally, if you live in the UK, they offer free shipping as well. Buying a cheap Android TV box doesn’t mean you have to settle, but it does mean that you need to look closely at the device you’re buying. What do you think? Do you have a cheap Android TV box that should be on this list? Let me know in the comments below! Is there a noticeable difference with gigabit Ethernet? Hi John. It depends on how you’re using it and what speed your Internet service is. If you’re using the basic Internet speed, it’s usually going to be about 10Mbps. In that case, the 100Mb adapter is going to be just fine. But, if you’re paying for the high-speed Internet, it’s usually around 130 Mbps – sometimes faster. In that case, you’d be hitting a bottleneck with the 100Mb adapter. Gigabit would definitely make a difference there. H96pro is for my money the best bang for your buck. Just about as future-proof as you can get for the price ($70) and more than capable for all realistic “TV box” requirements. This review was before the 96pro came out. That is a nice box.. a little pricy but it has everything I look for in an Android.. except I’ve seen one with eSata ports, USB 3.0, and DVR features with RCA and Coaxial which I want for a local DVR setup that saves to my NAS. But I digress.. it looks like a great little box. That being said, not all manufacturers are the same and sometimes the software on them are crap.. closest to stock is best even if you have to install Kodi and whatnot. P.S. Be careful, the reviews I’ve read state it’s only 16GB though many places show it as 32Gb for whatever reason and I’ve seen a lot more bad reviews than I’d expect.. so you might have better luck going a different direction. My own personal experience, the only Android TV Box I haven’t had issues with yet (out of about 6 different types I’ve tried even when spec’d higher) is the KIII… reliable, stable, and just a great little box (it’s kind of ugly to be honest though). I notice a considerable difference just streaming over my network but I have like 20 devices that access a server. It sometimes limits my options, but I can’t bring myself to buy anything without Gigabit ethernet. That, and I haven’t had the best experience with the Amlogic S912s (but it may have been the devices themselves) but have had pretty much no issues with the Amlogic S905 or S905X. I also don’t buy an Android TV Box with less than 2GB of RAM or 16GB of storage. That said, I try to keep my price point about or under $60.. for the money, the best and most reliable (but not most fancy looking) Android TV Boxes I’ve found is the KIII and I’ve tried a few. I’ll also never go back to a Android TV Stick (again bad experience and no Gigabit ethernet.. plus they get hot and non-dedicated power is often a problem). I love my KIII. how do you update yours? there’s no OTA and i cant find a rom. Oh how I wished I would have had this article before I bought my TV box and everyone should be really happy to see it now. It could have saved myself lots and lots of hours of wasted time reviewing box after box looking for something that would meet my needs. For me the most important feature after some of the basic stuff like the type of processor and amount of RAM and ROM is; Over The Air [OTA] updating. While I eventually found all of the right firmware and software I needed to update my box; it was not an easy task. Things like which USB port to use for thumb drives or how to format the MicroSD card and where and when to push the toothpick were all learned experiences. Never again. From now on it will be just clicking on the link that says “check for updates”. Great article Tim. A home run from where I sit. I agree about the OTA updates. I’ve done a few manual updates and it usually wastes a good chunk of my Saturday afternoon. Things never go right the first time. OTA is definitely the way to go. Just a quick addition to this, the T95M is a generic sold by a few companies such as Leelbox, which is who I prefer on this device. I own basically every OTT brand (if the brand even exist since I can’t ever find any info on them besides there Chinese tv app) but this version only has the 1/8 and no Bluetooth but it boots up in under 15 seconds, runs Kodi very well and is extremely refined and works very quick with no lag and has the led clock on the front of the box. Wired it will run at 98mbps dl and 24 upload, and is only $35, is say that’s a fairly good deal. Plus its android 5.0. I test and review boxes for two sellers on Amazon so I always have a new box coming, this week I received 3 and still have 14 of them laying around but the T95M I actually purchased and when I saw how well it worked I bought another. But no ota updates, luckily I have a friend in Canada who will write custom rims for my boxes to include twrp recovery so I don’t need to worry about bricking. And I must say I agree 110% on the allwinner and especially RockChip who recently put out a horrible fork of kodi called RKMC which I immediately removed. With RockChip they won’t even release the code to RKMC so how could one expect it to progress in any way because its well known RK isn’t big on continued development of a product once out but at least they made an attempt but here is my biggest issue with RK I recently received a new 2/16 RK device which I have two types, so that’s great, but not really because they partition storage into two parts, one for apks, which I have about 20-30 for movies and live tv etc, but that storage of 16g Rom is split into .96g for apps total including what system apps are already using up the majority of that space, then the rest for NAND FLASH storage, which would be pictures, music, movies I guess and whatever but not the all important apk and its not just those two devices, I’ve been unfortunate enough to receive 6, luckily free, RK devices and no matter if its a RK3368 or which ever, they all partition the storage that way so I can essentially add 6 apk files, but has to be apk because if those were in the playstore, which they arent, but it would give the good old storage full message even with over 100mb left and a 5mb download. But on top of it most play store apps won’t update because it always gives the error storage full so I will at times need to uninstall kodi in order to let my apps update then reinstall it from an apk file outside the play store which is a huge hassle but I set up one of the 2/16 RK devices for kodi only and removed every app I could even while it came rooted and it works outstanding for that one purpose but kodi has stopped development for RK as you mentioned so no version past 16.1 will work which at this point is my favorite version. Also there is an amlogic M8S with S812 that is great but runs 4.4 lol, I did just receive a S912 running 6.0 with a/c dual band, bluetooth, external antenna gigabit Ethernet and is great but I believe it runs $99 in a metal housing. So far so good. The T95M has a 2/16 version but I also received two S905X boxes this week and I hate to say that yes 6.0 is great on them but there are a lot of bugs in that CPU and it heats up extremely fast so plan on running a laptop or noktbook cooling pad under it which I do with all my devices, they are usb powered and perfect to sit under the box and keep it cool and most turn off when you power off the box. I think this was a good article with sound advice. Id say for now, stick to S905 over S905X unless they do come with regular updates. There are a million boxes exactly the same with a different sellers name on them but then all come in a box that says OTT TV, but running a few apps I see that some are actually nexbox like using CPU–Z and AIDY64. Best of luck and stay away from RK stick to amlogic and id be careful of the S905X for a while without regular updates or unless you have a friend who writes custom rims for you or you can find them on the two major sites but even then its not always easy to get each device to be recognized once in recovery. I briked a RK and when I went to add a custom Rom with twrp to fix it, the factory tool recognized the box one time but never again and there is a second half of that Rom that is added by usb when the first half by sd. Good luck, read lots of reviews from verified buyers if on Amazon. I receive boxes in exchange for an honest review and I give just that, when I don’t like something I let it be known but if there is a fix to it I also let that be known as well. Great article I look forward to the next one. Great comment Eric! There were a couple of other TV boxes that almost made the list, but I figured I had to draw the line somewhere. Five devices seemed like a good place to stop. You put so much work into this comment, I’d like to see your reviews. Do you have a link to one you liked? i have 3 x M8 Boxs around the house which i,m completely satisfied with,, there is enough programmes available for down load which would keep you watching for years. I get a lot of questions on the M8 boxes. It’s good to hear someone has a good experience with them. I have had three Android boxes, and my biggest complaint is the UI. The user may have to deal with a cumbersome drop-down menu, tiny screen messages, and poor brightness of menu choices. In your future comparative articles, can you address their UI features? I’ve got a plan to do an article about the launcher interfaces across some of the major streaming devices. Not just Android TV boxes, but players like the Fire TV and Roku as well. I agree. the UI and the remote control provided by the manufacturer.. or even 3rd party ones like the Rii I8, seems to be inadequate to make use of the Android box to be enjoyable or user-friendly. The more I use Android boxes, the more I think it has to do with the controller as well. The voice search and D-pad controls of my NVIDIA Shield are effortless. I don’t have to think about what I’m searching for, I just speak it and the device finds it for me. Only if it’s really, really, cheap. I took a look at the specs and the only device on their site breaks Rule #1 of the things I won’t skimp on: It’s still running Android 4.4. To be honest, it looks like one of those “fly by night” places that might not be around in a year. I could be wrong, but there’s some warning bells going off in my head when I look at their site. Wow. Looks like my fingers weren’t cooperating there. Good catch on my typo Karl. Thanks! I’ve got both the the MXQ Pro and the Nexbox A95X (S905X 2 + 16). I’d buy the A95X again if I was looking for another one. The Beelink GT1 looks good…but the S912 boxes don’t seem quite polished yet. Hi Greg. Definitely not polished yet. With any new chipset, you’re buying into the future a little bit at the expense of the present. nice to see a review of cheap tv boxes. i’m thinking of diving in. couple questions. i have two roku devices, the stick and one of the first boxes. that is the load speed of say, netflix, on a tv box compared to the stick? and is there a big difference between a box that has 2g vs 1g for ROM? not planning on gaming or anything. thanks! Hi Paul. Great question. I always say, whether its a computer or a streaming box you’re talking about, always buy as much RAM as you can afford. It will make the biggest bang for the buck – all other things being equal. To be honest, I wouldn’t even look at anything with 1GB of RAM anymore. As far as comparing sticks to boxes, the boxes will almost always give better performance than the sticks. In general terms, boxes will have newer processors and better cooling systems than sticks. This makes a big difference in longevity because heat will kill the internal components fairly quickly. Thanks so much for this article and especially the recommendations. I’ll be ordering one from the list soon. Probox2 Air doesn’t play h265 content correctlyit looks blocky, almost interlaced, when playing thru Kodi. Also the picture is noticeably darker than my RaspberryPi running Kodi, which is something else that needs to be fixed. I’ve posted these problems on the Probox2 forums, as have others so its not just me having these problems, and haven’t received any comments from the company, which is frustrating. Other than that the Probox2 Air is a fantastic box. Once these bugs get fixed I’ll be 100% happy with the product. Hi Andrew. Thanks for the comment. Not hearing from the company is concerning. One of my pet peeves is when companies ignore their customers. Please keep us posted. It sounds like this stuff could be fixed with a firmware update. Hopefully they’l get their developers on the issue for you. I wish I had seen this article before I bought my android tv box. I bought a Lee1box s1, with android 6.0, but it freezes up constantly and any apps I download from the google play store freeze up. It only has 1 G RAM, which is just not enough, and it is quad core. I’m still wondering about the new element Ti8. I couldn’t find any reviews yet beside Amazon but hard to believe those when there’s only 12. Has anyone here experienced this device yet? Hi again Luis. I’ve gotten quite a few requests for the Element Ti8, so I finally got my hands on one to review. You can check out my Element Ti8 review here. Hi Raj. Not yet. It looks to be a fairly generic S905 based box though. Nothing overly special unless some company takes it and modifies the firmware and tweaks the launcher. I wanted to let you know that I went ahead and bought the Beelink GT1, the one with 2G RAM. Octacore, and with dual band wifi. It is so much better than my previous android t.v. box. This Beelink actually works about as well as my android tablet. It doesn’t freeze up. It is not a buggy mess like my old box. It didn’t have hardly any apps on it, but I was able to load a lot of apps from the google play store and from amazon, and everything works fine. I use it mainly for websurfing, shopping, emailing, youtube, and amazon videos. I’m thinking about getting another one to use as a desktop pc alternative, for the times when I don’t need to use windows software, which is most of the time. So, this is just for people out there wondering if any of the android boxes actually work. The answer is yes, some of them work great. But you have to find the right ones. Unfortunately, many of them out there are a buggy, freezing, crashing mess. Hi Kelly. Thanks for the question. I haven’t heard of Henscoqi before, but it looks like a rebranded generic box. I’d stick with something like a Beelink which makes very similar devices, but has a better history. I’m wondering if you’ve heard of the ABox by GooBang Doo? Based on what I’ve learned from your site (and thank you), it seems like it will be good for my needs (streaming shows and moving up from my 10 year old Nintendo wii+netflix combo). Hi Jasmine. The GooBang-Doo is one of the basic, generic boxes that you’ll see rebranded for different manufacturers. There’s nothing wrong with that, per se. The box has good specs at a good price point. You won’t get any bells or whistles with it though, and support may be a bit sketchy. Hey guys. Am looking for a box that will run emulators great (PS1, GBA…) and one that I could hook up PS3 or PS4 controller with. This said, what would be your recommendations? many thanks! I’ve been reading these comments with interest. I purchased a Minix U1 with Air mouse. I’d say the performance is great. Easy to set up as I’m a newbie in regards to these products. Yes I had to upload Kodi Jarvis onto it, but youtube provided a very easy solution. Once done, streaming 4K is excellent with no issues at all. I love the A2 Lite air mouse. This item makes typing in the search bar, a breeze. Yes a little expensive, but I think it as future proof, for the next few years anyway, well, that’s how I sold it to the misses, ; ) lol. Steven King, Personally I was very Disappointed in the MiniX u1 I returned it. Since I had previously owned the Zidoo X6 pro and was very pleased with it I decided I would go with Zidoo again so I purchased the Zidoo X9S and very comparable in price to the MiniX u1 but wow what an impressive device I cant praise it enough. Excellent article! I’ve just gone through 2 boxes – both I returned. Qbox akasa – sound through hdmi was choppy otherwise perfect but it got to me especially for 80 dollars. Leelbox m8s – awful performance and ui. Sent back in a day. Thinking new chip but limited feedback? Or highly rated but older chip? I like the beelink but its too expensive on amazon and not prepared to wait for 3-4 weeks shipping. I recently bought a Dolomee D5 tvbox from a friend of a friend for 80 bucks. I then noticed that these boxes can be had for a fraction of that so I assume this seller value added software??? I knew nothing about these boxes prior to this but have been learning since I’ve been having so much trouble with this Dolamee D5.. mostly movie/show download performance – I had to switch to the Ethernet from WiFi but i still see issues. Not sure if its the box or the sources being used. After reading this article and learning about the RockChip issues with Kodi, I believe I now know why I see glitches in the video and and audio. I think I’ll be buying one of the boxes recommended above but will i be able to get to the new movies and shows like Game of Thrones when i do? New to the scene and have researched what I could this week. I have some bad news and good news for you. The bad news is that I completely ignored all your advice and bought a fully loaded box from Ebay. It says Tx3 Pro on the box and is described as the XGODY Android 6.0 Smart 4K TV BOX. It has KODI 16.1 loaded on it (Not sure if you can upgrade that to 17.0 with ease or not). S905X Quad Core and 1GB/8GB (I know you said 2GB/16GB is the minimum that you should look for these days). It only cost me $40 and I figure it will be a decent device to learn on/from. But here’s the good news. I have also decided to take your advice and am going to get the Beelink GT1 from Amazon. It is described as – Beelink Android 6.0 GT1 Smart TV Box Amlogic S912ARM Mali-T820MP3 GPU up to 750MHz(DVFS) RAM DDR3 2GB ROM Onboard eMMC Flash 16GB 1000Mbps LAN BT 4.0, and is $65. They also offer one that is 2GB/32GB, for $7 more. Should I consider that purchase, or no? Either way, with the two boxes, I look forward to the easy setup of the first and learning on it, and the “project” that will be the second one for me to learn how to use build on my own. I have two TV’s in the house anyways, and my girlfriend is cutting the cable and getting rid of DirecTV soon so worse case scenario, she will end up with one of them. (Going to get her a digital TV Antennae too so she can keep her local news station that she wakes up to everyday, which honestly, is the only reason she still have the Dish anyways). I’d love to hear your opinions on any of this, and also a couple of more things. I would like to ask you what you know about the Blaze Key, if anything, and if you think they are worth it? The commenters on the product seem to feel it saves you hours of time and are impressed with the regular updates. And lastly, having not received anything of yet, everybody seems to make it seem as if getting an aftermarket remote should be a priority. With the two purchase I’ve made/am making, do you feel I should make it one as well? I have used tons of different brands, hands down the company I am most impressed with is Zidoo. The Zidoo x6 pro is by far in my opinion the best box under 100$ that I have used 89.00 dollars to be exact. Now If you are looking for what I seriously feel is the most impressive easy to use android box on the market do yourself a favor and purchase the Zidoo X9s. It is just incredible!!! Its fast, operator friendly, comes with ZDMC(Kodi) factory installed, its built out of high quality avaition aluminum, it can also function as a router. This beauty is running android 6.0 and also has an easy update feature if ever needed right in its menu options. Its using Realtek RTD1295 chip interneral storage is 16GB Memory is 2HB but it has an SD card slot that supports 1/2/4/8/16/and 32GB cards. Dual band WIFI, HDMI 2.0a output support 4K @ 60fps this baby also has an HDMU 2.0 input for its awesome Picture in Picture option that I find so awesome. The X9s has 2 USB 2.0 ports as well as 1 3.0 USB port 1 RJ-45 Ethernet Jack 10/100/1000Mbps. Its supports 4k and 3D its quad core 64 bit ultra HD its supports HD audio(7.1ch) passthrough and down mix it also comes with a SATA cable so you can use it with an external hard drive. Seriously I own 4 of these boxes and have also purchased them for friends and family. I have zero association with the Zidoo company and no finacial stake whatsoever. I just love their products especially this particular one, at a $149.00 out the door including shipping through amazon if you have prime account. This thing in my eyes is the holy grail of Android boxes, I feel the only thing more equiped out there is the nvidia shield but that is reflected in its price. Personally besides the mind blowing option of 500GB of storage on the Nvdia, I still would rather use the Zidoo X9s hands down. Hello I have a small hotel with 20 rooms and I want to install tv box in each. The rooms are located on 2 floors and there is a wireless high speed network in the hotel with 2 wifi booster wired on each floor. so I don’t need anything too complicated and is easy to install. Would appreciated your input. Thanks. Are these boxes preloaded with any apps, or are they “blank” (so to speak) except for the essential apps? I have a M8S for about a year and a half, which is rooted and I didn’t know at the time (I bought it from a guy who was selling them in the city I live in, I knew nothing about TV Boxes at the time). I realized I wasn’t getting the OTA updates and everytime I checked in the app it wouldn’t work, I did some research and found out it was rooted. I’m scared to do the tooth pick method, because I heard it can brick your device and wipes it clean. But now that I know a bit about TV Boxes, I thought that I would buy one that wasn’t preloaded to save money and then I would just download Kodi and YouTube and all the other apps I want because now I know how to do it. Going back to the tooth pick method, will it always update the firmware? For example if I was to do it on my M8S TV Box running on 4.4.2, would it update it to 5.0 or higher? As you have mentioned in your guide for setting up Android TV Box, I accidentally came across your website that provides complete guide for Android TV Boxes, I will call it an encyclopedia on Android TV Boxes that provides everything from Android TV Boxes, Kodi, and a host of very useful guides. I am from Bangalore, India and interested to setup Android TV Box. Checked your site and other locations and found MXQ Pro has 1GB of RAM, and 8GB of storage space available suitable for my use regarding price, etc. However, I am using Sony (CRT) TV which does not have HDMI interface. Please guide how to connect this TV Box to my Sony TV? What about the X96 mini tv Box, is that a good choice for Kodi? Depends which version you’re looking at. There is a version with the AmLogic S905W and one with a RockChip RK3229. Be careful to get the AmLogic if you’re looking for it. That being said, the S905W is a low power version, so it won’t have the same performance as an S905 or S905X chip. Still, it’s hard to go wrong for $30. I’ve included a link to the product entry at GearBest here. Is this a decent one? Also does that memory impacts performance too much? would 2 gb +16 Gb me moch more faster. I doubt that I will be watching any 3D or 4K content. I’d stay away from anything with only 1 GB of RAM or 8 GB of storage. It was barely tolerable a few years ago. Now it’s just way too underpowered. Both of the devices in my “fully loaded Kodi box” article are right around the $150 CDN mark. To be honest, I’d spring for the extra $30 above what you were looking for. It’s a small price to pay for two companies that I know will take care of you after the sale. What would be the best boxes for a non tech novice? Hi Scott. It depends on what your preferences and streaming habits are. If you like Netflix or Hulu or YouTube, then I’d probably go with the new Fire TV. It’s not as versatile, but it’s got great picture quality and it’s simple. If you’re looking for something that’s fully loaded with Kodi addons that you don’t have to fool around with, then I suggest one of my fully loaded Kodi box recommendations. While i understand some of the things you listed i personally think theres nothing wrong with rockchip or any of the generic boxes either. Spending 20-50 bucks on a media player isnt the same as a major appliance and really after owning dozens of these media players since back during the xbmc days of the current kodi i have found that with the exception of performance very little else is different among them,,lets be honest,,who shops for a low price media device based on its support,,,come on,,lol,,the only device ive seen fail in that regard was the Boxee Box and even then there was enough community support to continue using it,,Honestly just about any android version will run kodi well enough in recent years so thats another thing thats being overthought here,,while admittedly most folks including me would rather have the latest slickest ui possible,,its not a game changer when your looking for a device to run kodi on,,,lets be honest here 99% of these boxes are purchased with the intention of using Kodi on the front end anyway. What do you think? I’m not looking for anything too fancy, just wanting to watch Netflix, and movies/TV shows. Let me know if you get it and what you think of it. All these tv box are only for basic non demanding games. Android have some very demanding games and it will always have problems on any tv box. No matter how much ram, its useless but you must have minimum 1GB ram for videos and less demanding basic games. You will need 2GB for most of the normal demanding games in Google Play but however the touch functions disable you to play in tv box. The Flash needs at least 8GB and better to have 16GB and above. The problems with these tv box are their processors. None of these tv box have the capability to run high demanding games. They have lots of problem playing them. You need more than 2.2Ghz dual core processors to run these games smoothly. All those quad core, octa cores are useless! Ghz is the requirement! Nice to know this but not everyone plays games on them as some have actually grown up. So only kids would think these are “Useless”. Since gamers have actual game systems why would they even want a cheap box? They are all guilty of it to some extent. If not right out of the box, cheap Chinese boxes will eventually give you so many headaches you’ll smash tthem up to pieces. Do not drop money on any of them. Nvidia Shield is below the $200 mark now, get it and forget it. Buy Best fully loaded Cirkud T95N android TV box in Canada at Low Cost We have many Android TV Boxes and streaming devices for you to choose from. At Buydroidbox.ca, you can shop with confidence and peace of mind. Once you download pre-configured version of Kodi from our app store, you will have unlimited options for entertainment. Watch the latest movies, TV shows, listen to music and watch live Tv. Paying for Roku or firestick with much less on both is just plain crazy. Ever notice that neither provide it’s specs on the boxes anywhere. They grossly bloat it’s description about how many channels you can watch and apps that can be used. The Roku ultimate only provides the user 1Gb of memory (should you Goole it you will find it says “unknown”) however that’s what you get. This is because they “Roku” ARE charging a premium for the box and if the purchaser was aware of this with today’s Android box competition the Roku Ultra is a complete embarrassment and not even in the same league as any Android box providing 3 or more. As far as the storage it only provides 512 mb! Y ou must purchase a SD card for any real storage. Here comes the insanity …. Roku charges $100 for it !! Absolutely insane. The only thing you are paying for is the name as far as the product it’s a joke on every level in my opinion and anyone else’s who has connecting brain cells. I have been researching Android boxes now for the past 5 years and can safely say both roku and the firestick are both grossly overpriced and underpowered.